HISTORY : Lawa came from Lok Kawi Wildlife Zoo in May 2008, at the age of 1. PERSONALITY : A sun bear who will certainly catch your eye is Lawa. Lawa has a very beautiful face. She likes to be solitary in the forest. She usually walks off alone in the forest enclosure to climb and forage. She is the first one that likes spending the whole day in the forest enclosure. It seems as though she is eager to show that her world is in the forest! Lawa is free to explore her forest enclosure. She also made a beautiful tree nest by using liana and tree branches. She is also one of the friendliest young bears around. In very exciting news, after learning in BSBCC for six years Lawa is ready to be released back to where she belongs – the forest. 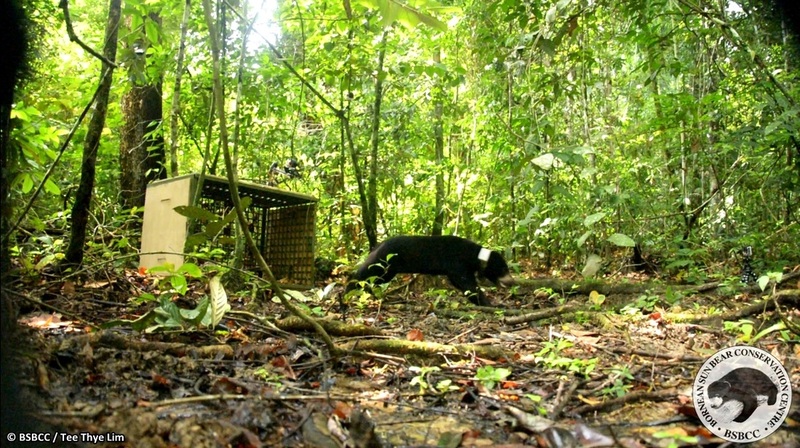 On July 25th, 2016 this is the SECOND time that a captive sun bear got reintroduced to its natural habitat in Sabah using a helicopter underslung and is monitored post release with the help of a satellite collar. Lawa has acquired many vital survival skills and she is ready to return to her real forest home. IDENTIFYING MARK OR TRAIT : Lawa has a thin chest mark and a pointy face. Due to her slender face her eyes look pulled back.